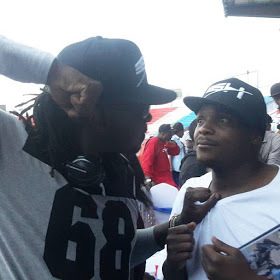 Top Kenyan comedian, Mzee Jalang’o Mwenyewe alias Jalas was among the many soccer lovers who graced the much hyped super 8 Tournament which is sponsored by sportpesa. The event went down on the Nyayo National stadium a couple of days ago. 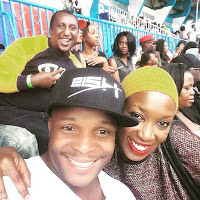 Kenya’s Jay Z and Beyonce, Nameless and Wahu Kagwi were also present and Jalang’o seized a moment with Wahu, taking a super cool and hot photo that ‘provoked’ Nameless. Hahahahaha!!! I never knew that Nameless was a big joker! Huh! He decided to ‘confront’ Jalas as Wahu was laughing her heart out.